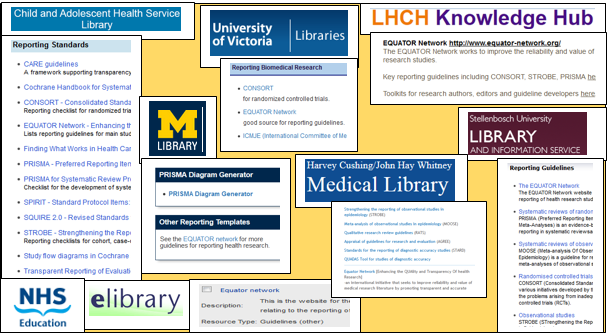 Librarians are excellently positioned to raise awareness of the importance of complete, accurate and transparent reporting of research studies amongst the clinicians and researchers with whom they work and the EQUATOR Network is keen to help support librarians with these activities. 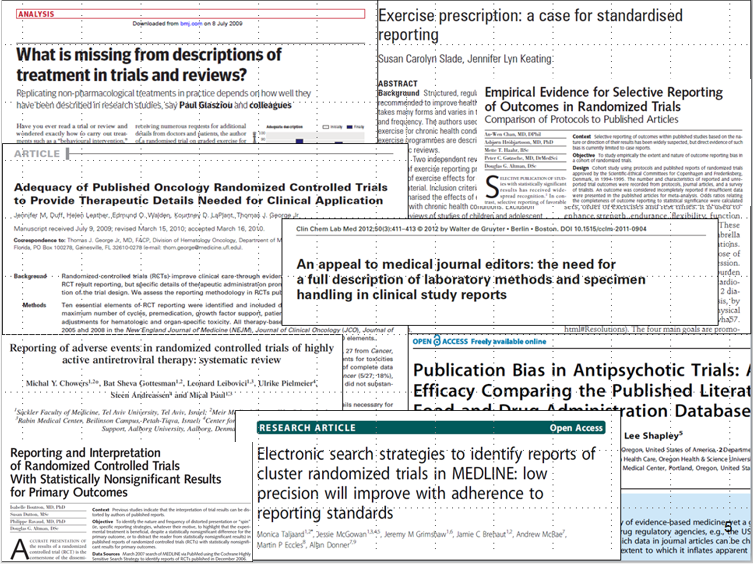 There has been much discussion and concern in the medical literature recently about the quality and reproducibility of published biomedical research studies and what actions can be taken to address this global issue (please visit the Lancet Waste series and campaign and the REWARD Alliance web pages for more information). Librarians, through identification of new opportunities to provide additional research support, can play an important role in addressing these issues by working with clinicians and researchers to improve the quality of the research studies published by their organisations and institutions. There are many ways that librarians can help to promote reporting guidelines and contribute to increasing value and reducing waste in biomedical research. In direct response to the Lancet waste series, we at EQUATOR, wrote a blog post outlining some ideas [download a pdf of the blog post]. A recent blog post by JoVE also raised awareness of the role of librarians and highlighted resources from the EQUATOR Network designed to support librarians in helping to improve research reporting and reproducibility. In a recent article, published in the European Health Information and Libraries Journal we also discuss identifying opportunities for biomedical librarians: “Impactful librarians: identifying opportunities to increase your impact”. 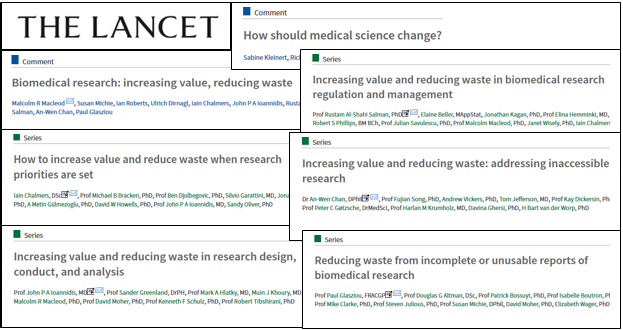 We have also tried to raise awareness of the contribution that biomedical librarians could make in working together with researchers, clinicians, journals and funding bodies to increase value and reduce waste in research in a comment article published in the Lancet in April 2016. In May 2017 we launched two action plans with suggested actions that biomedical librarians could take locally within their library services to help to address international issues of research reporting and reproducibility. This action plan highlights some simple and easy to implement ideas for librarians to try out in their libraries. This action plan promotes more in-depth targeted actions that librarians could take to directly respond to specific recommendations made in either the Lancet Waste Series or in the recent Manifesto for Reproducible Science. Increasingly, biomedical librarians are recognising the importance of providing information and links to resources from their library web pages that promote reporting guidelines and support transparency and research reproducibility. The image below simply provides a snapshot of the numerous libraries around the world that currently do so. We are currently working with the Gerstein Science Information Centre at the University of Toronto on a project to help raise awareness of reporting and reproducibility issues during the systematic review process by helping researchers and clinicians to develop review protocols and use relevant reporting guidelines. Learn more about this collaboration. We are very keen to work with biomedical librarians to help address these global issues. We are in the process of developing resources (documents, presentations, leaflets/posters, videos, e-learning etc.) specifically to help librarians and information specialists address international issues such as research waste and research reproducibility, promote reporting guidelines, hold research reporting workshops and provide the clinicians with whom they work with the relevant reporting guidelines for their research studies. Whilst we develop these we have brought together some useful general introductory resources for you to use and have included links to these below. We also intend to develop training resources specifically aimed at librarians/information specialists so that they can feel confident when including information about reporting guidelines in their induction sessions, when running reporting guideline workshops or simply when talking to clinicians about reporting their research. We aim to do this through establishing a free to join international librarian and information specialist network which will allow us to provide further practical support to librarians by providing librarian training, Q&A sessions, regular support webinars, an email discussion list, and an opportunity for librarians to share their experiences about raising awareness of research reporting guidelines and explore possible collaborations. We plan to partner with other organisations to translate all materials to ensure that librarians/information specialists can deliver reporting guideline information and training sessions to clinicians and researchers in their local language. Please email Shona Kirtley for more information or to sign up to the Librarian Network. This page will be regularly updated to keep you up to date with all developments regarding the toolkit and Librarian Network. Page last updated on 13 March 2019.